Usually at this point the other person looks quite puzzled, says something like “ahhh… that’s… interesting”. The conversation then turns to lighter subjects. Quite similar to this video (if you do know a thing or two about Bitcoin, this is a good laugh). In an attempt to turn puzzled faces into interested and somewhat understanding ones I will tell you about a concrete example of how Bitcoin already is much more than digital money used for shady purposes. Affordable Online PhD’s! Buy Now! Do you ever watch your spam folder? One of the types of spam I receive most often is from websites who want to sell me fake university diplomas. I don’t know how many people actually buy these things, but judging from the amount of sites selling fake diplomas there are probably some people showing fake documents at their job interviews. It would be good if there were some solution for certifying that an academic certificate (or any certificate for that matter) is authentic. And preferrably this solution would be available at low cost, be highly reliable, have a very long life and be available right now. The University of Nicosia (the capital of Cyprus, which has an interesting financial situation and history itself, but that’s another story) has developed a solution doing exactly that, using the Bitcoin public cryptographic ledger: Academic Certificates on the Blockchain. To understand how it works, you’ll have to know what this thing called the blockchain is. It is the core technology in the Bitcoin network. As the name suggests it is a chain of “blocks” which contain the transactions or payments. The blockchain contains every Bitcoin payment ever made. It has the interesting characteristic that as the chain gets longer, older information becomes more reliable, because each block has a cryptographic reference to the previous block. The security of the blockchain is generally regarded as unbreakable using methods currently known or foreseen. To learn more about how the blockchain works, this 22-minute video is an excellent introduction. So, when I pay you 50 millibitcoin or mBTC (currently worth around EUR 15), this payment is stored and publicly available forever. It starts to get really interesting when you know we can add a bit more information to our transactions, like the remark field in a bank payment. This information will also be stored forever. By using this information creatively, interesting applications are possible right now. And that’s exactly what the University of Nicosia have done. When Simon Student has completed a course, he receives a personal certificate as a PDF document (A), as do his fellow students. This PDF document would be too big to fit into the blockchain in its entirety. Therefore the University makes a “digital fingerprint” (for the techies out there: a SHA-256 hash) of each student certificate and place these in an index document (B). A digital fingerprint of the index document itself is stored in a transaction in the Bitcoin blockchain (C). New blocks are added to the Bitcoin blockchain, each referring to the previous block in a mathematically verifiable way (D), forming a guarantee to the security of the information that grows stronger with time. The index document contains the instructions on how to verify these certificates. It is made available through channels other than the university website, so that anyone can access it. 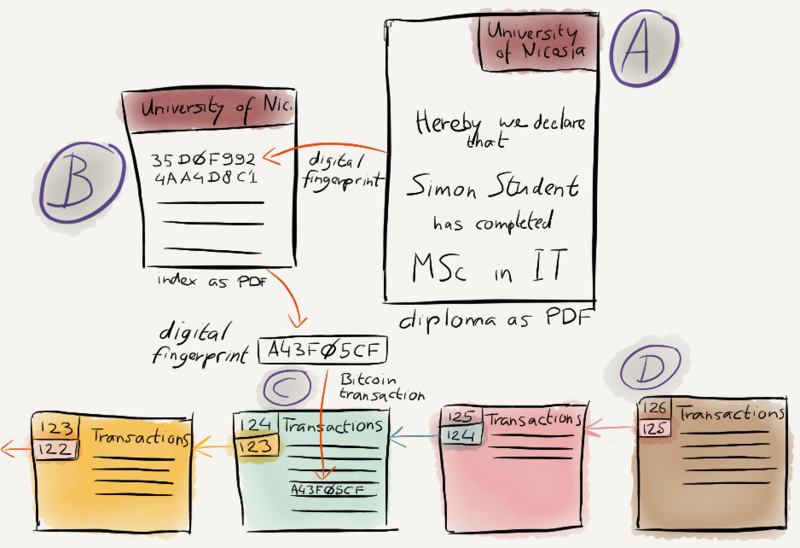 Using these publicly available instructions, anyone can verify that the index document with signature “A43F05CF” was indeed made by the University of Nicosia on that particular date, and not by Simon himself or a website selling fake diplomas. Similarly we can confirm that the PDF that Simon Student has presented is authentic by looking up its fingerprint “35D0F992” in the authentic index document, and verify that Mr. Student has indeed completed his Master of Science in Information Technology at this university on that date. To verify that an academic certificate is authentic, we need only the public Bitcoin blockchain and the publicly available index document, not the University itself or any other centralized organization. In fact, the certificate could still be verified if the University would cease to exist. Even in the unfortunate scenario that the Bitcoin network would come to an end, mathematically verifyable copies of the blockchain itself are likely to be available online for a long time into the future. This was the tale of one university doing powerful things by making smart use of a small feature in Bitcoin. Right now many smart people around the world are building interesting applications on the blockchain, and building the next generation of these technologies. This will bring possibilities for decentralized trust that go far beyond this example. When I say we’re only just seeing the beginning of the technology behind Bitcoin and that a great future lies ahead, this is what I’m talking about. I am very happy to be contributing my tiny bit to shape that future by envisioning, architecting, developing and consulting about solutions that help organizations get the best from these powerful possibilities. What will your organization do on the blockchain?